Finding the perfect camping vehicle is almost impossible. There are always trade-offs and always something that could be slightly different or better. Having said that, we reckon Alan and Soraya’s cab-over 101 is near on perfect for two-up touring – whether it’s for a weekender or that huge lap of our great countryside. Sure, it’s built like a brick outhouse – square; but that’s makes it all the more practical for fitting everything inside, on top and underneath… bugger the looks. But hey, beauty really is in the eye of the beholder and I for one actually dig this look…it’s got character, manliness and practicality all rolled into one big hunk of 4WD. 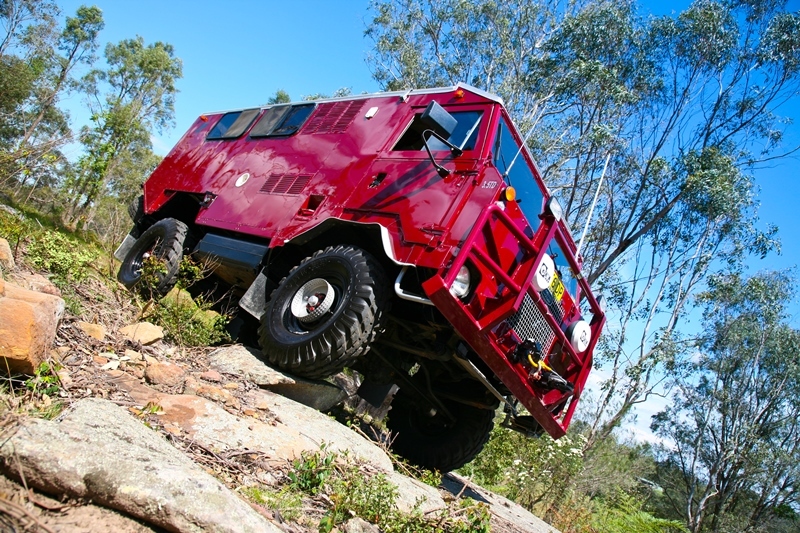 Now this 101 is a far cry from how they originally patrolled the various countries around the globe; not only is it adorned in a non-standard deep burgundy colour – much nicer than drab army green – it features major driveline components from a few other makes and models a far reach from Land Rover HQ. For starters, the original gas-guzzling petrol Range Rover sourced 3.5 litre alloy V8 has been swapped for a frugal 3.5 litre, 4-cylinder, intercooled turbo diesel from a Mazda truck, to which has been grafted (via an imported Samurai conversion kit from the UK) a Range Rover LT95 high and low range transfer case (fitted with high speed gear ratios) and manual 4-speed gearbox – WOW, does that make a difference to the running costs as well as both on and off road driving. Alan tells us his Wombat (as he affectionately calls it) can nudge along easily at 100km/h. While the mesh grill at the front (behind the bull bar) can be removed to access some components, most of the engine is accessed from within the cab once the heat and sound-proofed centre console is removed – the engine sits right between driver and passenger. The standard radiator is retained, albeit with a little extra ducting to help with its cooling. Both front and rear diffs are standard Salisbury units packed with 4.6 ratio gears, while the rear has had a McNamara manual diff lock added. Manoeuvring the big 101 (which relates to a wheel base of 101 inches) is via a rather large diameter steering wheel, although the job has been made easier with the fitting of a GQ Nissan Patrol steering box and custom made steering arms. Long, supple, leaf springs both front and rear provides (according to Soraya who resides in the passenger seat next to Alan) an excellent and comfortable ride on all road surfaces; in fact, there are only two leaves at each corner, all of which have double military wraps. To provide a little extra comfort, Land Rover Defender bucket seats have been installed with the addition of an extension on the lower seat section on the passenger side – Soraya has longer legs than Alan! Silverstone MT 117 285/85R16 tyres on steel 16 x 6.5 inch rims provide an excellent offroad biased tyre, while standard drum brakes have been retained and do a fine job of holding back Ugly Betty…or the Wombat. A wombat really is an apt name for this vehicle… if you close your eyes and imagine something of this shape nudging its way through the scrub; a giant wombat perhaps… with bull bar, turbo…diff lock…and pop top! A steel bull bar provides protection to the front end and provides a good purchase point for the Cibie Super Oscars spotties and radio antennae. There are also the final hooks of a Norwegian-built Nokken R1BJ centre-mounted (just to the side of the left hand chassis rail) PTO winch resting on the lower passenger side within the bull bar. This PTO / capstan type set-up can (with a fair amount of work) be re-routed via a series of standard underbody pulleys to pull from the rear with its 65m of cable. A great ability in practice, but geeze, I’d hate to be the poor sucker that had to crawl underneath to do the job after Alan’s got the whole show bogged in waist deep mud! As a side note, some 101 mid-mounted PTO’s had the ability to drive a separate output shaft at the rear of the vehicle, which then drove a trailer that had its own driveshaft and differential. This provided an articulated 6WD vehicle, but unfortunately didn’t make it into full production. Alan’s 101 has the ability to do this with a few extra parts simply bolted on. At the rear, twin wheel carriers have been grafted under the body utilising LandCruiser wind-up mechanisms. That allows for easy access to the heavy rim and tyre combination. Above the spare wheels sits an aluminium storage box, work light, reversing camera and 9kg LPG bottle. Three batteries power the 101; a 135AMP unit with a 100AMP alternator to start the engine and run general lighting, plus two separate deep cycle units via a separate 80AMP alternator for the on-board 110 litre Waco fridge / freezer and extra power needs. Two 50 watt solar panels mounted on the roof also help to keep the batteries topped up – especially useful when camped in the one spot for extended periods. Inside is neat, tidy and 100 precent practical. Once the roof is popped up via the gas struts and scissor action mechanism, there is plenty of head room to stand. The L-shaped lounge converts to a double bed and there are drawers and under-bed storage compartments to house all your gear. A conventional oven with gas cook top, plus a microwave oven ensures the couple won’t go without a good feed while on the road and a digital TV keeps them up to date with the latest news and entertainment. Underneath are two separate fuel tanks each of 80 litres, plus a 70 litre water tank which is plumbed via an electric pump up into the stainless steel sink in the camper unit. Setting up camp is ridiculously quick and easy: unclipping a few over-centre latches on the outside, walk inside for a gently push upwards to allow the gas struts to effortlessly raise the whole roof. Meshed windows are accessed by unzipping the soft PVC side walls allowing a bit of flow through ventilation. All up, Alan and Soraya have had many extended and far-reaching travels around Australia in their 101. They love the setup and wouldn't trade it for anything. Perhaps, after all, some vehicles are made just right… after many hundreds of hours modifying and tinkering! Ugly maybe, but perfect for this couple – definitely.